I like this especially for the temperature control. You can tweak an actual dial much more precisely than a digital control. Nice feel and not too heavy, doesn't weigh you down. 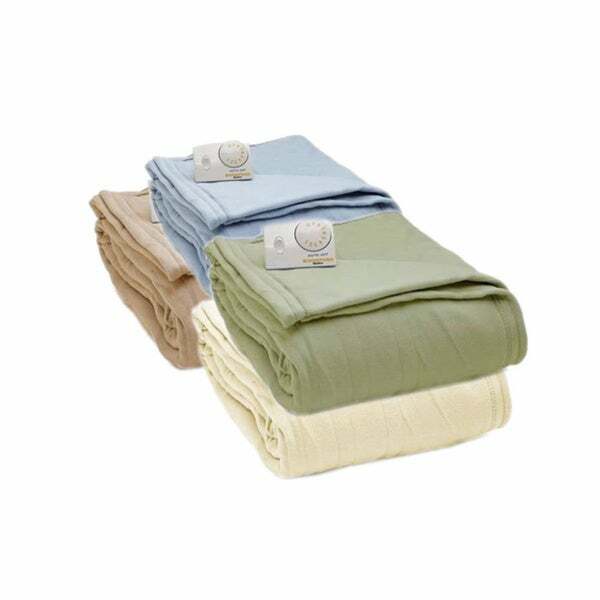 The Biddeford Comfort Knit Fleece Heated Blanket features one analog controller with the twin size, or two controllers with the queen or king sizes. Made with soft, 100-percent polyester and features 10 personal heat settings and a 10-hour automatic shut-off. I ordered this blanket for my son's bed it is very soft and a pretty green color. My son said this blanket keeps him nice and warm at night and I am hoping it will cut down on our gas bill. We have had a couple of cold nights but the electric blanket was all he needed. I would recommend this blanket to others. I purchased this blanket for my guest room, current company says it is very soft, light in weight yet keeps them warm. Controllers are easy to operate. I would purchase again. Very satisfied with Biddeford Comfort Knit Heated Blanket! great blanket, works a little different, control light stays on all the time, just turn off then on again when you want the heat to come back on, it's a auto shut off. It's cold turned warm again. I an enjoying biddeford fleece heated blanket with analog control very much. I like the SATIN TRIM. This was truly the best purchase I’ve made in a while. We had snow during winter so this blanket was perfect. I also like the fact that it turns off automatically after 8 hours of being on. Great buy and great price. I love this blanket had it for a few days now. I have a queen and you have to have two gages for each side of the blanket which at first I wanted my whole blanket to heat up but truly if you heat up one side you're whole bed warms up. Now like I said I only have a queen not sure how it would be on a king . But all in all I love it ! If you do but this product follow instructions to a T ! We were looking for a heated blanket that was NOT velour or microfiber as they are too heavy. I have been looking for a year. I found this product and ordered it hoping it was the perfect fit for us AND it was! I like to sleep in a cool room but want my bed warm. This blanket is lightweight and has several settings so you can be as cozy as you want. Had to return due to faulty wiring on one side. Looked nice and think could of been good if not for the bad wiring. Heated up first time, then didn't. Switched the cords on different sides to see if it was the cord and it didn't heat up, forgot to turn it off and was on highest setting later during the night heated up some and then realized it was probably faulty wiring. So returned. Heavy duty, stylish color, warns bed quickly.Good quality. Great bargain for the price. I comparison shopped at many in store and online sites this was the best deal. This keeps us warm! If one doesn't want to be warm, they can adjust it accordingly. My only issues is the cords and tripping over them. Its like tooo many. But.....I figured it out. I had to run them under the bed and place them on the side of the bed (floor). I really wish there was another way but hey its seasonal anyway. And it works! I purchased a King because of Plush Pillow top Queen mattress. I wanted to make sure every inch was covered and warm!! Love it! Purchased for my daughter, she loves it. Even living in the south, you need a warm blanket and this one heats up nicely. Works like a charm, color is nice, and have no regrets. Bought two of these as gifts and the recipients loved them. They are lightweight but very warm they can really wrap up in them and they like the different setting options. Going to buy another one for a friend. Great Price as well!! Bought this as a gift for my daughter and her husband for Christmas and they love it. The dual controls make it so much more user friendly. One stays cold and one stays hot. I love this -- and my two dogs refuse to get out of bed in the morning till it is turned off and the chill in the air invades their sleep. Then they wander downstairs to the fire. (I live in the country). It seems to have a good thermostat because it doesn't get too hot, but just warms and stays warm. Highly recommended. Exactly what my mother was looking for, she loves it! "Can you feel the coils/wires through the blanket?" Yes, but it is so much better than the heavy velour like blanket we had previously. That one was so heavy. 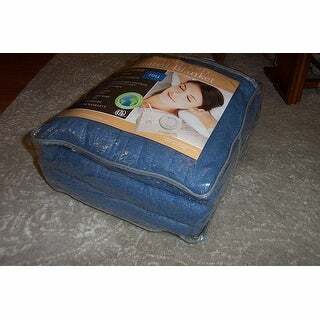 "I purchased an electric blanket that is plush. It is actually 2 layers, is too heavy and gets tangled in the top sheet. Is this a 2 layered blanket?" No it's one layer. It's perfect. "does this blanket have dual controls?" Yes, for queen and King sizes only. "Does this blanket have a satin trim?" No, this blanket does not have a satin trim. Have multiple of this Brand and love them! First of all, I need a new blanket and I came to you because I have always had success when ordering from you. In other words, I trust you.